The Philadelphia Stars had appeared in the first two United States Football League Championship games, and won the second. For the 1985 season, they had become the Baltimore Stars in anticipation of the USFL’s move to the fall for ’86. While it created an awkward arrangement, with practice facilities in Philadelphia and home games shifted to Byrd Stadium at the University of Maryland, the Stars were still a strong team on both sides of the ball. The conservative offense continued to be directed by QB Chuck Fusina and featured RB Kelvin Bryant, and the defense was outstanding, having given up a league-lowest average of 12.5 points per game in ’84. Organizationally, under owner Myles Tannenbaum, President/GM Carl Peterson, and Head Coach Jim Mora, the Stars were the class of the league. They opened the 1985 season on February 24 against the Jacksonville Bulls. Coming off a 6-12 record in their inaugural campaign, the Bulls had admirable fan support (an average attendance of 46,730 per game). Coached by Lindy Infante, the team had taken steps to improve the offense by dealing for 35-year-old veteran QB Brian Sipe, most recently of the New Jersey Generals, and adding RB Mike Rozier, whose rookie season was spent with the defunct Pittsburgh Maulers. A crowd of 51,045, the biggest of the USFL’s opening week, was on hand at the Gator Bowl. 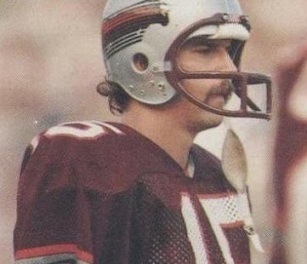 Near the end of the scoreless first quarter, Sipe went down with a shoulder separation after being hit from the blind side by CB Bill Hardee in the process of completing a seven-yard pass on a third-down play and backup Robbie Mahfouz took over for the Bulls. Sipe left the contest after having completed five of six passes for 51 yards. Brian Franco got the Bulls on the board first with a 42-yard field goal. He and Baltimore’s David Trout traded three-pointers for the remainder of the period, with Franco connecting again from 24 yards in between Trout’s kicks from 30 and 27 yards. The score was 6-6 at the half. Early in the third quarter, Fusina was picked off by Jacksonville safety Don Bessillieu. It set up Franco’s longest field goal of the day, from 51 yards, which barely cleared the crossbar. With 5:31 remaining in the period, and capping a 10-play, 69-yard drive, Mahfouz threw to FB Marvin Lewis for a two-yard touchdown. Jacksonville led by 16-6 after three quarters. Franco added two more field goals in the final period, from 27 and 50 yards, the first following a second Fusina interception. The last field goal also followed a turnover when Bessillieu picked up a fumble by Stars FB David Riley and ran it 40 yards to the Baltimore 45. The score was 22-6 with 8:40 left in the contest. Early in the fourth quarter, Fusina was sidelined with a thumb injury, bringing backup Tim Riordan into the game for the Stars. Now with one minute remaining in the contest, Riordan threw to WR Herbert Harris for a three-yard touchdown that he then followed with a pass to WR Willie Collier for a successful two-point conversion. The ending turned dramatic as the Stars successfully executed an onside kick that was recovered by LB Larry McCoy. However, after advancing to the Jacksonville 32, Riordan was sacked for a ten-yard loss and Baltimore was able to run just two more plays before time ran out. Jacksonville won by a final score of 22-14. The Stars had the edge in total yards (340 to 240) and first downs (23 to 12). They did well against Jacksonville’s running attack, holding the Bulls to 57 yards on 22 attempts while gaining 82 yards on their own 27 carries. However, the uncharacteristically sloppy defending champs also turned the ball over four times, to none suffered by the Bulls. Jacksonville also recorded four sacks, to none by Baltimore. After replacing Brian Sipe, Robbie Mahfouz (pictured below) completed 17 of 24 passes for 132 yards with a TD and no interceptions. The team’s leading receiver was TE Mark Keel, who caught 6 passes for 54 yards. Mike Rozier rushed for 30 yards on 13 carries. 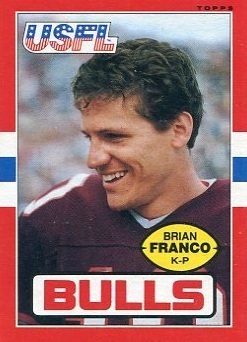 Brian Franco tied the USFL record with his five field goals in as many attempts. For the Stars, Chuck Fusina was successful on 8 of 15 throws for 122 yards with no TDs but two interceptions before having to leave the game. Tim Riordan completed 13 of his 21 passes for 117 yards and one TD with none intercepted. Kelvin Bryant gained 53 yards on 13 rushing attempts. Willie Collier had 7 pass receptions for 112 yards and WR Scott Fitzkee contributed 64 yards on his 4 catches. “Brian Franco had an incredible day,” exclaimed Coach Lindy Infante as he presented his kicker with a game ball. Franco had been cut by the Stars in favor of Trout two seasons before. He had also been cut by Jacksonville the previous year but was re-signed three games into the season. His opening-game performance ignited a fine season in which Franco was successful on 24 of 29 field goal attempts, was perfect on 45 extra points, and ended up with 117 points, which ranked fifth in the league and second among placekickers. Sipe was diagnosed with a “complete shoulder separation” and was out for 12 weeks. In the meantime, veteran NFL backup QB Ed Luther took over the starting job. Robbie Mahfouz returned to the bench and ended up completing 24 of 38 passes for 205 yards with two TDs and an interception. The Bulls put together a 9-9 record to finish sixth in the seven-team Eastern Conference. While the Stars continued to struggle during the first half of the season, they won five of their last six games and ended up in fourth place at 10-7-1. Having qualified for the postseason, they went on to retain the USFL title in the league’s last game.